The U.S. Merchant Marine Academy announced that it will resume Sea Year training for Midshipmen on three commercial carriers beginning in March 2017. The USMMA says the reinstatement of the program follows the implementation of comprehensive new policies, including a zero tolerance policy for sexual assault and sexual harassment, to ensure that the Academy’s standards are upheld. The “Sea Year Stand Down” was ordered last June by then Dept. of Transportation Secretary Anthony Foxx in response to reported incidents of sexual harassment and assault, hazing, bullying, coercion, and retaliation involving Midshipmen during their time at sea. The order directed the removal of all Midshipmen assigned to both U.S.-flagged vessels operating in the commercial fleet and federally-operated ships. 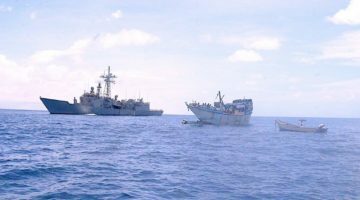 The Stand Down was partially lifted in July, but only for vessels operated by the U.S. Navy, U.S. Army, U.S. Coast Guard, and Maritime Administration. Last month, the U.S. Department of Transportation has announced its plan to restore Sea Year as part of the curriculum, but did not details on how or when it would be reinstated. The three commercial carriers that have been approved are Crowley Maritime Corporation, Maersk Line Limited, and American Presidents Line (APL), which together comprised about half of the Academy’s commercial Sea Year program before it was suspended, USMMA said. The addition of more carriers is being considered. Wednesday’s announcement was welcomed by the USMMA Alumni Association and Foundation (AAF). The DoT’s requirements for Sea Year’s reinstatement include a zero tolerance policy for sexual assault sexual harassment (SASH), vetted mentors, regular crew training, and no “fraternization” between crew and Midshipmen. The USMMA said the requirements will be reviewed after six months, and annually thereafter. “The results of these collaborative efforts establish a formal protocol that will improve conditions for the United States Merchant Marine Academy Midshipmen. These young men and women will receive valuable training on commercial ships that will strengthen the industry overall,” said Maritime Administration Executive Director, Joel Szabat. The Academy said a consortium of maritime industry companies and labor organizations is now working with MARAD to develop computer based training programs and best practices to combat sexual assault and sexual harassment (SASH). The National Defense Authorization Act for fiscal year 2017 also requires a working group to report to Congress in September 2017 on efforts to further address SASH prevention and reporting. MARAD is said to be reviewing applications from other companies that have applied to meet the Sea Year requirements.